When looking at art images, impressions accompany our senses and arouse our feelings, no matter whether we buy paintings or enjoy them at an exhibition. Both modern illustrations and the one from past epochs of art create impressions in each of us. These stay in our memory for a long time and influence our perception. Abstract and realistic paintings that have a positive effect on our senses are created through the colors of the composition of forms. Especially in my personal abstract art I like to be driven by these factors, so that each paint is created individually and concerns different feelings. Every painter uses different motives to express art. A very popular and special motif for paintings is nature. The atmosphere is created primarily by the aesthetics of nature, which provides an infinite source of inspiration for many artists, especially for the Impressionists. Here the viewer is brought closer to the nature through specific colors and forms. This approach is already known from the eras before Impressionism. However, what has been newly created by Impressionism and thus become typical for this time are the color combinations and the type of brush application. For painters from the Impressionism it was essential to use colors as an association for positive emotions and to astonish people. This automatically creates connections with beautiful things in life for us as the beholder in front of the art piece. In contrast to Impressionism, the viewer of today’s abstract art does not get a clear projection surface. The reason is the transformation of motives from nature which are often translated into abstract shapes and colors, which also includes a part of my own work. For me personally, the important art epoch of Impressionism as a source of inspiration, which always fascinates me in a special way. The interplay between light, color, forms and the perception of nature on the motifs is particularly well described in Wassily Kandinsky’s book “On the Spiritual in Art”. Here is an online edition of his book. Kandinsky is also one of the unmistakable artists of the epoch of Impressionism and dealt intensively with the above-mentioned topic in his studies. Therefore, I recommend anyone reading this reading as a basis for understanding Kandinsky’s perception of art and with it the Impressionism. If you prefer a general overview of Impressionism, this blog is also giving great insides about the epoch. A very impressive example and at the same time inspiration from Impressionism is the painter Claude Monet. The so-called “Father of Impressionism” captures in his pictures the moment of nature in the open air. These days the artist is known for his more than 300 paintings of water lily motifs and depicting bourgeois everyday life. Especially on his property in Giverny he collected inspiration for his art. His series of paintings in this place was created around 1880 and includes important stages in its development. Monet painted nature, especially the coast, the way he saw and experienced it. This is how the painting “Scogliere e barche a vela a pourville” (English: Cliffs and Sailboats in Pourville) was created, which is one of my favorite works by the artist. He spent a lot of time alone here, away from his family, but clearly raved about the beautiful surroundings that freed him from his worries. In order to create his paintings more lifelike and convey the emotions that accompany them, Monet often painted outdoors. 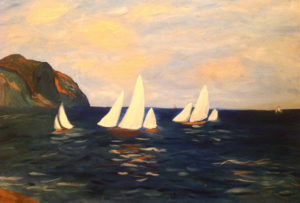 This painting was also created during Monet’s studies off Pourville’s coast. The composition of sky and water, the wide view of the horizon and the blending of the bright colors of the painting evoke a warm summer feeling familiar to each one of us. The lightness, the boats floating on the water and the big rock create a certain peace that fascinates me every time anew. With a certain closeness to nature, the viewer looks far into the distance and sees the unattainable events that are depicted in the painting. The perspective chosen by Monet is leading the image in the middle separate horizontally. In the lower half is the composition of several sailing boats, which are visibly driven by the wind. The viewer is automatically directed to the center of the picture and thus to the large-scale painted boats. These seem to be painted of a couple of some brush strokes, compared to the rest of the artwork and stand for the simplicity in this paint. In addition to this seemingly simple motif, the well-known natural elements – sky, water and earth – are dominating on the opposite side the painting. The water is bluish, but appears almost green, which is typical of the coast of France. The boats on it are reflected on the waves of the water. Monet painted the water with a rough order of oil paint. 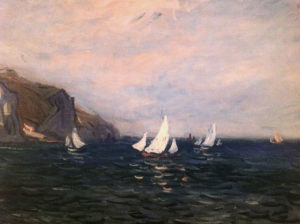 The result is a natural movement of the water, which Monet supported by the breeze of the wind realistic representation. During this time, the painter spent a long time in France’s coast and was able to study closely the surrounding nature. He was able to set each brushstroke so that different directions of vision arise. The painting is made very close up, rather than from a distance. This typically impressionistic representation allows the viewer to choose his own distance in order to become aware of the composition. Another important motif in this paint is the rock. This one is on the left side of the picture. The rock, like the water, is brown and green in natural colors. Pastel shades additionally envelop the motif. The rock rises out of the water. At the same time, the viewer is given no further clue to assess whether this is a single island or a piece of coast. The application of color distinguishes both of these motifs directly from each other. Looking more closely at the stroke of the brush, it is striking that Monet did not paint the rock as roughly as the water did. As different as the natural elements of earth and water are, the same way of differentiation does the artist convey the color composition and the application of colors in the paint. The perspective of the picture and the comparison of other paintings with similar motifs at this time suggests that the coastal section continues on the left side. The artist possibly painted the picture standing directly on the mountain. Finally, there is the last element in this painting: the sky. For this, Monet chose light pastel shades to create a mix of bright blue, white and pink tones. Claude Monet painted very large clouds, which radiate a lightness, although they do not let the sun through. This lightness is created by Monet brushstroke and is supported by large white areas on the painting. By absorbing the same hue – blue – a balance between sky and water arises the more time is spent watching this composition. At the same time the artist differentiates the divergent natural elements by the opposite style of the brush stroke as well as by the color itself. This technic brings out the all elements in their own way. Claude Monet’s style and the interplay of its colors underline the natural beauty of the landscape of France and the feeling of lightness and a summer breeze. Pastel colors meet at the same time rich and cool colors, a very successful variety, which creates a connection to the sun and relaxation and thus to positive emotions. Monet succeeds in captivating the viewer with his unique color combination and composition of such a simple motif and embedding it in his personal summer dream. The unforgettable feeling of summer is one of the reasons why I decided to paint this picture of the original and to decorate my apartment with it. Inspiration comes from emotions and is one of the most important parts of art, including my own. Artists like Monet have shown me how important it is to use colors and shapes in a targeted way to create emotions and at the same time leave enough lightness and freedom for the viewer. Like Impressionism in its time, I have the goal to create with my abstract art language impressions and evoke emotions that move and remain and thus become memories. Each one of my paints comes from a personal emotion that I want to transmit and share to inspire people. The first impressions can be found here http://www.annaschillerart.com/.